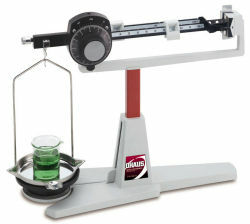 The Ohaus Dial-O-Gram Balance (310-00) is a favorite in classrooms and industries worldwide. The Dial-O-Gram balance offers high precision and remarkable value. The three-point base, special floating bearing principle and beam design eliminates the need for level adjustment. Zeroing is quickly achieved by means of a zero adjust knob at the end of the beam. With aluminum pressure castings for the base and beam assembly, agate bearings, steel knife-edges, and stainless steel pan, everything about the Dial-O-Gram balance ensures a high standard of quality. 89mm x 7mm / 3.5" x 0.5"